Print off this used dirt bike checklist and take it with you when trying to find your next bike. It may just save you from purchasing a lemon. Check the obvious things like broken plastics, a torn seat cover, bent handle bars, worn tires, broken clutch and brake levers, and a worn chain and sprockets. Make sure the chassis number has not been scratched off… this indicates a stolen bike. Check the (wheel) rims for cracks and bends. Check the frame/chassis – look for cracks, fractures, and old repair jobs. How worn are the discs (brakes)? If there are noticeable grooves where the pads touch – the bike has been well used. Is the kick starter sloppy? If so, this is another sign of a well-used bike. Look for fractures also – new kick starters are not cheap. Check the radiator for bent cooling fins and cracks. Make sure it’s topped up and not leaking. 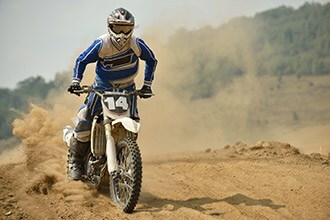 Make sure the front brake line is not worn from the guide on the front fork. If it is, this needs to be replaced. Put the bike on a stand with the rear wheel off the ground. Try and move the rear of the swingarm from side to side to check the swingarm bearings. There should be very minimal movement here – no more than 4-5mm. If there is, the bearings will need replacing. Gripping the tire like a steering wheel – wriggle the front and rear wheels to check the wheel bearings. You don’t really want any movement here. Check the fork seals are not leaking. You will see oil traces down the front forks if they are. Ask the seller questions like how often they service their bike or change the oil. Ask for receipts of any claimed rebuilds or repairs done. 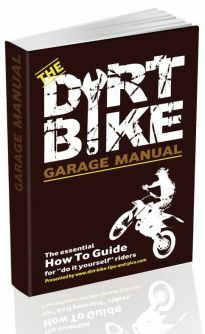 Take a look around the seller’s garage or property where they’re selling their dirt bike. If the garage or home is a shambles you can probably bet that they are lazy and wouldn’t have looked after their bike very well either. Everything looking good so far? It’s time to take it for a spin! When starting the bike, check the compression in the kick start. If the piston is worn out, the down stroke will be soft and effortless. Unless you have ridden a number of bikes this will be difficult to gauge though. Especially on different sized engines. Next, listen to the engine. If it makes loud, unusual tapping noises, then it could mean the motor’s well worn and requires a rebuild. Again, this can only be picked up by someone with experience. Now for the fun part! After a decent warm up… give it s#@! You need to be able to open it right up to really see how it runs. So make sure you have a decent sized area to test her out in. Test all the gears as sometimes certain gears fail on older bikes. Make sure you feel comfortable with its power delivery and ‘rideability’. After all, a tweaked-out, peaky rocket isn’t necessarily going to make you ride any better or faster. I'm the co-owner of DBP. I live in Meridian, Idaho and enjoy dirt biking with my wife and two boys throughout the Idaho mountains.